Free to download from the Sola website! Sola Publishing recommends the use of the Lutheran Church—Missouri Synod version of the Revised Common Lectionary (RCL), as found in the Lutheran Service Book (LSB), from Concordia Publishing House. Lectionary inserts and other worship products produced by Sola Publishing are based on the LCMS version of the RCL, rather than the ELCA version. Used by permission. 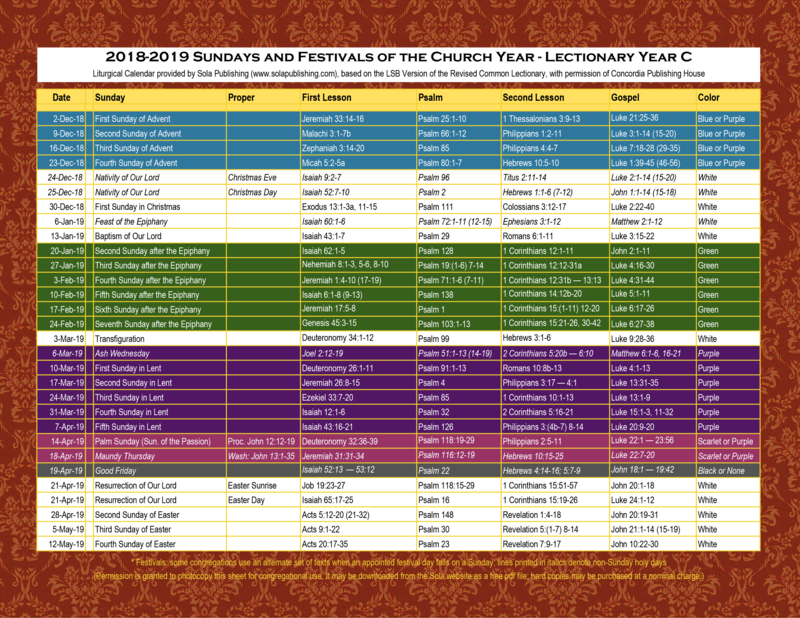 As a convenience, or for those who may not have access to a color printer, hard copies of the Sola Liturgical Calendar can be ordered here on our online store for just $1.00 each. This daily Bible reading guide, Reading the Word of God, was conceived and prepared as a result of the ongoing discussions between representatives of three church bodies: Lutheran Church—Canada (LCC), The Lutheran Church—Missouri Synod (LCMS) and the North American Lutheran Church (NALC). Here you will find fine quality hardcover lectionary volumes (one for each year A-B-C) which use the ESV and are based on the version of the Revised Common Lectionary found in the Lutheran Service Book (LSB) -- the same schedule of readings that are recommended by Sola.